WOW! What an amazing ancient well. It is fairly obvious that this well was here long before Christianity. 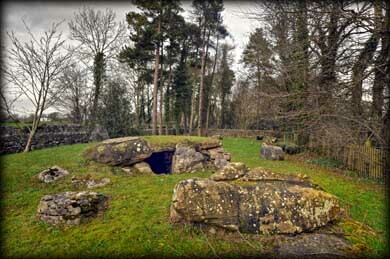 It has the appearance of a small wedge tomb with its cairn intact. It is such a pity that the well has dried up. The well is now dedicated to St Anthony and immediately in front of it is a Mass Rock , used by Priests during penal times. 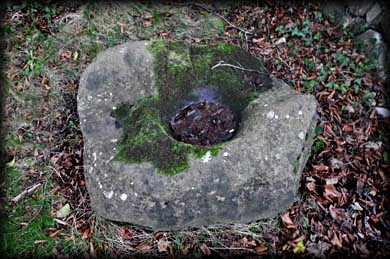 Tucked away in a corner is a large stone with a single huge bullaun. These are usually found at early christian sites, but like the well, it too may predate christianity. The whole site has been turned into a small millennium garden commemorating Irish History through the Celtic, Christian Viking, Norman. Penal and Famine eras, right up to Irish Independence. Situated: From Tullamore take the R421 South. After 2.5 K turn right onto the N52. Take 2nd exit. Turn right at roundabout. After 1.8 K turn right. After 3k there is a right turn. The well is 30 metres down here on the right. Discovery Map 48: N 2718 2382. Last visit Nov 2011.